I just got finished writing up a major new article on Io over at Wikipedia covering the exploration of Io. This article covers the discovery of Io by Galileo, the observations of Io from Earth leading up to the space age, and the spacecraft that have performed science at Io, covering the Pioneer, Voyager, and Galileo missions quite extensively, and touching a bit on the future of Io exploration. The Exploration of Io, one of Jupiter's four largest moons, began with its discovery in 1610 and continues today with Earth-based observations and visits by spacecraft to the Jupiter system. The Italian astronomer Galileo Galilei was the first to record an observation of Io on January 8, 1610, though Simon Marius may have also observed Io at around the same time. For the next two and a half centuries, Io remained an unresolved, 5th-magnitude point of light in astronomers' telescopes. During the 17th century, Io and the other Galilean satellites served a variety of purposes, such as helping mariners determine their longitude, validating Kepler's Third Law of planetary motion, and determining the time required for light to travel between Jupiter and Earth. Based on ephemerides produced by astronomer Giovanni Cassini and others, Pierre-Simon Laplace created a mathematical theory to explain the resonant orbits of Io, Europa, and Ganymede. This resonance was later found to have a profound effect on the geologies of the three moons. 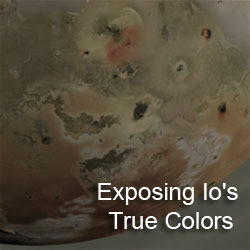 Improved telescope technology in the late 19th and 20th centuries allowed astronomers to resolve (that is, see) large-scale surface features on Io. 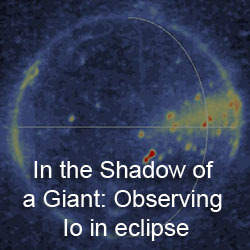 New technologies also allowed astronomers to estimate Io's diameter, mass, and surface composition, as well as discover the moon's effect on Jupiter's magnetic field. The advent of unmanned spaceflight in the 1950s and 1960s provided an opportunity to observe Io up-close. 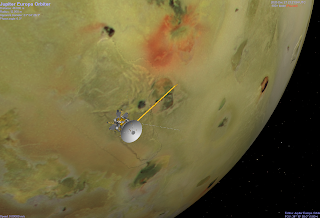 The flybys of the two Pioneer probes, Pioneer 10 and 11, in 1973 and 1974 provided the first accurate measurement of Io's mass and size. Measurements from the Pioneers also allowed for the discovery of an intense belt of radiation near Io as well as an Ionian ionosphere. In 1979, the two Voyager spacecraft flew through the Jupiter system. Voyager 1, during its encounter in March 1979, observed active volcanism on Io for the first time and mapped its surface, particularly the side that faces Jupiter, in great detail. The Voyagers also observed the Io plasma torus and Io's sulfur dioxide atmosphere for the first time. In order to study the Jovian study in better detail and over a longer period of time, NASA launched the Galileo spacecraft in 1989, which entered orbit in December 1995 following the first close flyby of Io by an unmanned spacecraft. Galileo orbited Jupiter until crashing into the giant planet in September 2003. In between, Galileo flew by Io six more times between late 1999 and early 2002, providing high-resolution images and spectra of Io surface, confirming the presence of high-temperature silicate volcanism on Io. Distant observations by Galileo during parts of the missions allowed planetary scientists to study surface changes on Io's surface as a result of the moon's active volcanism. Following Galileo and a distant encounter by the Pluto-bound New Horizons spacecraft in 2007, NASA and the European Space Agency (ESA) generated plans to return to the Jupiter system and Io. In 2009, NASA approved a plan to send an orbiter to Jupiter's moon Europa called the Jupiter Europa Orbiter as part of a joint program with ESA called the Europa/Jupiter System Mission. The ESA component of the project, the Jupiter Ganymede Orbiter, is on their short list of large-scale missions to be launched in the next decade with final approval coming in 2011. While these missions will perform Io science as ancillary to their primary mission targets, the proposed NASA Discovery mission, the Io Volcano Observer, would explore Io as part of its primary mission, though this project still needs to go through a competition process to be approved. In the meantime, Io continues to be observed by Earth-based astronomers, utilizing new technologies such as adaptive optics and improved telescopes such as Keck, the European Southern Observatory, and the Hubble Space Telescope. Again, the rest of the article can be read over at Wikipedia. 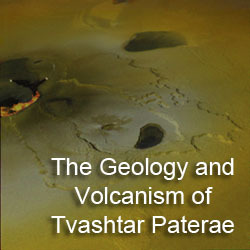 Among the things you might learn include Io's role in the drawing of the Mason-Dixon Line, post-Pioneer models of Io's surface composition, and the sampling of the Thor plume by Galileo.